How Would You Change the Constitution? Here's My Proposal. Al Carroll is Assistant Professor of History at Northern Virginia Community College, a former Fulbright Scholar, and the author of "Presidents' Body Counts:The Twelve Worst and Four Best American Presidents Based on How Many Lived or Died Because of Their Actions," available on Kindle, Lulu, and Smashwords. More information on him is at http://alcarroll.com. How would you change the constitution if it were up to you? How should we as a nation change the constitution? Even asking the question gets angry and outraged responses. This is so even though parts of it are poorly thought out, anti-democratic, and have done tremendous damage to the nation. For America’s constitution is a sacred cow. Some cows should not be worshiped. Some should be slaughtered. That is not true of all of the US Constitution, but America would be better off if some parts of it became hamburger. For nothing should be so revered that one cannot question it, change it, or discard it, and blind worship is always to be avoided. There is, among those on both the political left and right, what can only be called widespread constitution worship. Most on both sides hold up the constitution the way a vampire hunter in the movies holds up a cross to ward off vampires. Everyone from the most stoned pot smokers to gun toting militia groups calls on the constitution as support for causes, beliefs, and attitudes they hold dear. This constitution worship is every bit as blindly enthusiastic as it is unknowing of the actual history of the constitution, and how and why it was adopted. For this, most people are blameless. People cannot be faulted for what they were not taught, or more often, falsely taught. I made the same argument in Presidents' Body Counts, and others, notably James Loewen in Lies My Teacher Told Me, argue likewise. For the founders themselves did not think much of the constitution. Jefferson wanted a new constitution every twenty years. Other founders disagreed, largely because they were not sure the constitution would last twenty years. For the founders, it was a pragmatic and even temporary measure, not holy or intended to be permanent. Constitution worship did not become a regular feature of American society until near the start of the twentieth century, in part as a way to assimilate immigrants. 1. Abolishing the Electoral College. 2. Ending the buying of elections. 3. Limiting the time campaigning for office, as they do in Great Britain. 4. Ending wars quickly in Vietnam, Iraq, and Afghanistan. Each war continued over half a decade after the American public wanted to get out. 5. Reforming the office of vice president, widely regarded with contempt by most, and producing candidates that even most voters of the same party as the presidential candidate did not want. 6. Ending corporate welfare and other wasteful spending. 7. Ending most foreign military aid, and support for tyrants around the world. 8. Limiting the power of the Supreme Court. 9. Ending the political monopoly of wealthy elites. 10. Guaranteeing privacy from government intrusion. Each of these proposals have widespread bipartisan support and are hugely popular across the political spectrum by great majorities. But none of these proposals, not too surprisingly, have majority support among elected political elites, economic elites, or the leadership of either party. The constitution itself is the biggest barrier to solving these problems. Not one of these problems have been, or ever could have been, quickly solved, precisely because the constitution makes it difficult. Most of these problems require a constitutional amendment, something made deliberately long and difficult by the founders. A few of these could be solved temporarily by ordinary laws, which could then be easily overturned next election. So why not go to the root of these problems? Why not a new constitution? Constitution worship is the reason. Most Americans have been so heavily propagandized to think of the US Constitution as undeniably great and downright sacred, something you just don’t question without being seen as un-American. What is pretty comical is to see the most idealistic of leftists, who are deeply cynical of everything else that is elitist and coming from powerful and wealthy institutions, become like a fundamentalist when the constitution is brought up. What is equally comical is to see populist conservatives or libertarians become enamored of government power when it is enshrined in a document written by, after all, Deists and Enlightenment-influenced thinkers who did not trust organized religion or nobility. Both are smitten by constitution worship. There are two obvious ways to deal with that. One is to challenge the holy stature of the constitution. Write the true history, which most historians and political scientists already know is not a noble one, but one of elitists hijacking a popular revolution. The other solution is to keep what is best about the old constitution while adding to it. Propose a new constitution and a new constitutional convention, but make one of the first proposals to keep the best of the old document. For the best of the constitution is not the original document at all. The best part is the amendments. The original document is not about rights and all about power, who has it and how they can wield it, and that it will always remain in the hands of elites. The amendments are what most rightly revere. Keep the amendments, and amend the original document of power to spread the power to the mass of people, and add more amendments to limit the power of elites, for good. That is what proposed new constitutions or new amendments try to do. They add to the best of the document, keeping all the original constitutional amendments. What of the first solution to ending constitution worship? Tell the true history of the constitution, uncensored, without the heavy doses of patriotic propaganda that leave out its elitist nature. That story has already been told many times in the fields of history and political science. But to help the curious who may not know, let me summarize the history of the adoption of the constitution. To do that, one has to go back to the American Revolution. The American Revolution was not a real revolution. It was an independence movement. In actual revolutions, elites are overturned, killed off, imprisoned, or forced to flee the country. America's elites, plantation owners like Washington and Jefferson, were actually strengthened. They no longer had to listen to British authorities. Many scholars, the best known being the eminent Charles Beard, argued the real motive for the founders' rebellion was economic. The British Empire was run by mercantilism, which required colonies to trade only with the mother country. The founders wanted primarily more profit from trade much more than political freedom. But there were many in the working classes who wanted a true class revolution. There had been class warfare in the earlier English Revolution, Roundheads who were middle class and anti-nobility, and the Levelers, primitive versions of communists who wanted to level off the wealth anyone could possess. In the American Revolution, there were anti elite groups like the Sons of Liberty, and populist rabble rousers like Samuel Adams, George Mason, and most of all Thomas Paine. There was a populist wave of the American Revolution before it was hijacked by the largely elitist founders. The Massachusetts Revolution of 1774 happened a year before the Battles of Lexington and Concord. The public took control of Massachusetts courts, forcing judges and the Governor and Lieutenant Governor to resign. They overthrew every county government in Massachusetts. That is why the British were occupying Boston in the first place at the time of Lexington and Concord. This was just the start of a populist revolution. There were over 90 Declarations of Independence before Jefferson's, from counties, cities, and states. Most were based on George Mason's in Virginia. Jefferson's was an elite attempt to shape a popular uprising. There were also popular uprisings within the elite-led independence movement. There were mutinies within the US Army, in Connecticut, New Jersey, and Pennsylvania. Congress was forced to use a draft, bounties, even the promise of slaves to gain recruits. After the war, there were early experiments in anarchism, socialism, and other notions very revolutionary for that time. For a year, Pennsylvania tried shutting down the government entirely. Pennsylvania also tried outlawing the collection of debt, a form of wealth redistribution. Slavery ended in seven northern states. One out of eight slaves in the US were freed. New Jersey even gave women the right to vote. Though first done accidentally in 1776, it stayed on the books until 1807. Aristocracy and feudalism were ended in the US. Noble titles, primogeniture, and entailment (the wealthy being able to seize public property) all ended. There was enormous confiscation and redistribution of wealth during and after the revolution. (Try telling that to a Tea Party member.) Most British loyalists and many aristocrats, whether they sided with the colonists or with Britain, lost their property. Established state churches in nine of the thirteen colonies were abolished. These were all fairly radical changes, and many Americans wanted to go even further. American elites’ fear of class warfare created the US Constitution. The most pivotal event was Shays’ Rebellion. Farmers in western Massachusetts tried to stop foreclosures on their farms, so they shut down state courts. Jefferson called this, “liberty run mad.” Washington called it, “anarchy and confusion.” What horrified the founders was not the size of the rebellion. It was minor, with few deaths. The fact that it took so long to break the rebellion worried them. And at the same time, the French Revolution was going on. They feared this minor rebellion might grow into a similar class revolution. All the radical experiments in wealth redistribution added to that fear. The founders called the convention in direct response to Shays' Rebellion. The constitutional delegates had a low opinion of the public. They believed most people were just one hungry belly short of becoming a howling mob, that the average person was selfish, unreliable, and easily misled. They wanted the nation to be run by “men of quality” and argued the wealthy must be protected from the general public above all else. “Those who own the country ought to govern it,” as John Jay argued. The Constitutional Convention was secretive. There were no notes taken, except Madison's, done at the end of the day in his room, against the wishes of the convention. The public was barred. So were the press. The delegates, just like Colonial Congresses before them, took oaths of secrecy to keep debates from the public. There was almost no debate on expanding the power of the government. The elite delegates already agreed in advance on most questions. The US Constitution was and is deliberately anti-democratic, designed to look like a democracy without actually being one. Great power was given to the president. The assumption was Washington would be the first, and the clumsy Electoral College put him in. Electing a president was deliberately made cumbersome to stop anyone not as admired as Washington from being elected. The founders did not want competitive elections, but presidents chosen almost by acclamation. Ratifying deliberately excluded opponents of the constitution. Special state conventions, not legislatures or the public, ratified the constitution. Even so, as word leaked out, the public turned against this document that most were not allowed to vote on it. Elites at the special state conventions began to get nervous. Votes against the constitution were highest in Massachusetts, New York, Virginia, North Carolina, and Rhode Island. The Massachusetts convention only ratified the document after Governor John Hancock was promised (falsely) that he would be be the first president or vice president. In Virginia, George Mason and Patrick Henry successfully pushed for the Bill of Rights as a condition for ratifying. The first presidential election was planned without New York, North Carolina, or Rhode Island. New York actually prepared to secede and become its own country. Federalists in New York City then threatened to secede from New York. The New York convention backed down and narrowly ratified. North Carolina's convention defeated the constitution and held out a year before a new convention ratified. Rhode Island was the only state to hold a “popular” vote. (Not only minorities and women, except in New Jersey, were barred. There were property requirements to vote in every state.) The constitution was defeated in the state by a 10-1 margin, a good indication of what most of the public thought. Washington was actually elected without Rhode Island voting in the presidential election. Ratification took three years of enormous elite effort against the general public. Ben Franklin owned most newspapers in the US. An economic boycott was used by wealthy elites to shut down many of the other papers opposing the constitution. 1. The Electoral College means there has never been a direct election of presidents. Originally it was intended to be a veto by elites vs the general public. If they elected the “wrong” person, the electors were there to overrule the public. 3. The Supreme Court almost always defends wealthy elites. 4. The winner take all/majority rule system is less democratic than parliamentary systems in most other nations. It leaves small groups unrepresented, and cripples newer or smaller parties. 5. There is no mention of rights in in the original constitution whatsoever, except a stricter definition of treason. And the US Constitution was illegally adopted. 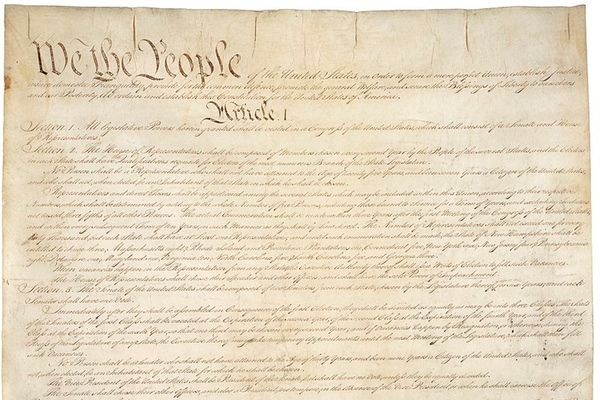 The Articles of Confederation's Article 13 states “…Articles of this Confederation…shall be perpetual; nor shall any alteration at any time be made in any of them; unless such alteration agreed to in Congress of the US & confirmed by legislatures of every State.” On both counts, the constitution is illegal. Neither Congress nor state legislatures ever confirmed it, only special state conventions. Obviously I am not suggesting resistance to the current constitution, or ignoring it. That argument leads to chaos, and only militias and sovereign citizens on the fringe embrace that. There is a legal concept which says even if a law was adopted by faulty means, it remains the law if it has been in force for a good length of time. My point was simply, when one hears that this is a nation of laws, remember that the founders ignored the highest law in the land, the Articles of Confederation. Being elites, and very elitist, they just went ahead and did it. Imagine a modern parallel to what the founders did. Imagine the wealthiest elites writing a document only they had any say in, and only allowing themselves to vote on it, and then declaring it the highest law in the land. That is what the founders did, and this is precisely why the original constitution deserves no reverence. Instead, let us resolve to craft a new constitution that preserves the best of the old, the amendments, and adds to it with a far better system of government and drastic limits on elite power. Unlike the original convention, any new constitution deserves, needs, and requires as much popular input as possible. While the proposals that follow were written by me, many of these proposals have been made in other forms before. Larry Sabato, a political scientist at the University of Virginia, proposed some parts of several of these articles, as have others. Calls for a new constitutional convention are ongoing. These proposals, and any proposals, need to come from you, the general public. Send in your suggestions, criticisms, counter proposals, and arguments. Spread the word anywhere and everywhere you can. This cannot and should not be done without all of you. The only real arguments for continuing the current constitution are stability, and a view of the American system based more on romanticism than actual history. 1. All articles and amendments from the previous Constitution of 1787 remain the final law of the land, except as changed by the following articles or later amendments. 2. Each of these following articles must be voted on and approved separately by two thirds or more of those voting to become the law of the land. 1. The Electoral College is abolished. The President shall be directly elected, with the winner being the candidate receiving the most votes. 2. The Supreme Court shall never, by any decision including indirectly, decide who shall be President. 3. The Vice President shall be nominated separately by each party and elected separately from the President, and also serves as the Secretary of State. 4. The Senate shall be 100 adult citizens chosen at random each year, representative of the adult American public by age, gender, race and ethnicity, religion or lack of, and income or social class. 5. Redistricting shall only be decided by nonpartisan committee, and gerrymandering to favor one party or dilute minority voting power is forbidden. 6. Congressional representatives' terms are changed to four years, elected in the same elections as the President. 1. The right to vote for all citizens of legal adult age is absolute and cannot be denied, limited, barred, blocked, or suppressed, whether by deliberate attempts or unintended outcomes. All current such attempts are ended. Any law with the outcome, even unintended. of making voting more difficult shall be immediately void. 2. Any official who deliberately or unintentionally makes voting more difficult shall be immediately removed and their decisions voided and actions reversed. Deliberately blocking others from voting or blocking voting recounts shall always be prosecuted and punished as a felony. 3. Voting days shall be national holidays, with a paid day off for workers only with proof of voting. 4.The voting age is lowered to sixteen for any US citizen proving their maturity by holding a job or living on their own. 1. All elections shall be publicly funded only. Private contributions or donations to or on behalf of a candidate or party, except for unpaid volunteer work, are outlawed. Corporate donations of any kind are forbidden, and business and corporate owners and management are forbidden from intimidating, pressuring, or influencing in any way their employees, punishable by long prison sentences. 2. Campaigning and advertising for all general elections are limited to the period of six weeks before election day. Campaigning and advertising for all primary elections are limited to the six weeks before the general election period. 3. No election, whether federal, state, county, city, special district, American Indian tribe, or of unions, civic groups, lobbying groups, or private clubs, is valid unless more than half of its citizens or members vote. If less than half of the citizens or members vote, there must be immediate new elections within 30 days with different candidates. 1. All eligible voters must vote. Failure to vote results in inability to receive all government benefits until the next election, including licenses, grants, subsidies, tax refunds, eligibility for public assistance, student or business loans or credit. 2. Those with strong and longstanding religious, philosophical, or political beliefs against voting are not required to vote if they declare said beliefs. 1. All rights in this and the previous constitution, as well as under all American laws, are limited to human beings only. A person under US law is defined as a living human being only. Corporation rights and powers may be severely limited by any and all governments, whether federal, state, city, country, special district, or American Indian tribe. 2. A corporation must serve the public interest and its life span shall be limited. Any corporation shall be permanently dissolved if they break the law more than five times. No business, corporation, or individual can escape fines, punishments, or legal judgments by declaring bankruptcy, or by the use of holding companies, shell companies, or any other diversion, evasion, or tactic. 3. The right to collective bargaining by unions or other workers shall not be limited more than other civic or lobbying groups, nor subject to government recognition. 1. The United States recognizes the great wrongs done by genocide against American Indians, apologizes fully, and shall always strive to make amends. All federally recognized American Indian tribes are forever sovereign, defined by their treaty or other legal relationship to the United States, with rights to decide their own government and laws, and to enforce those laws on all residents and visitors within their territory. 2. All American Indian tribes have permanent and absolute rights to their current reservation lands, forever. All federal lands, or lands reacquired by American Indian tribes, that are within these tribes’ historically recognized boundaries, or protected by treaty, will be part of their reservations. All sacred sites of federally recognized American Indian tribes shall be returned immediately, or protected by federal partnership if requested by tribes. 3. Native Hawaiians are recognized as a tribe by the US government and shall have a reservation with a sovereign government with relations with the US government and rights equal to an American Indian tribe. Nothing in this article shall be construed as denying or abridging Native Hawaiians' right to pursue the return to being an independent nation as they were before the illegal overthrow and seizure of their nation. 4. US citizens and nationals of American Samoa, Guam, Puerto Rico, the US Virgin Islands, and Washington DC have full local self rule, and shall vote in federal elections and have voting federal congressional districts. 1. The United States shall not go to war except in self defense, and permanently renounces wars or acts of military aggression. 2. The United States, its government, agencies, or agents shall never try to overthrow another nation's government again unless directly attacked by said government. 3. Unless under direct and immediate attack, the United States shall not go to war, and the President cannot deploy troops for combat without an official declaration of war by Congress. Unless under direct and immediate attack, the declaration of war by Congress must then be approved by a vote of the American public within 30 days. Failure to get approval by the American public overturns the declaration of war. 4. The US President can deploy troops to rescue US or other citizens and must prevent genocide, other large scale atrocities, or humanitarian disasters. The President must report to Congress on such action within 7 days and Congress must approve the deployment of troops within 30 days. 4. The US government is forbidden to go to war or use war as an opportunity to enrich in any way any American businesses, corporations, or individuals. Family members of government officials shall not be exempt from military draft, nor sheltered in special units, or in any other way. 1. Members of the public may propose referendums to pass new laws, recalls to remove for illegal or corrupt actions the President, Vice President, member of Congress, Supreme Court Justice, or any appointed official, or bring an end to wars or operations involving US troops. 2. A referendum or recall begins 30 days after the certified collection of valid signatures of ten percent of all voters. 3. No referendum may overturn, contradict, or limit anything in either constitution, and such efforts must be done instead by constitutional amendment. Nor shall referendums or recalls be funded by corporations or private contributions, except for individual unpaid volunteer work. Referendum advertising must be equally funded both pro and con, must be publicly funded only, and subject to reasonable limits. 1. National defense industries, healthcare, prisons, education, and news media must be nonprofit. No business, corporation, or individual can profit unfairly from the federal government or public resources and must pay fair market value for all current and previous resources, subsidies, and research. 2. No journalist, commentator, or others presenting themselves as experts in politics, history, law, society, health, medicine, or science can make more than five times the median national income, and any excess income must be donated to charity or it will be seized by the federal government. 3. All journalists, commentators, and others presenting themselves as experts for mass news media will be fined every time they lie in their articles, broadcasts, or public statements. No person or media outlet can profit from lies or falsehoods and fine shall at least equal all profit, money, or benefits made from lies or falsehoods. 4. The agency in charge of judging lies and falsehoods by journalists, commentators, or experts for the mass media must be entirely of respected historians for matters of history and politics, respected legal scholars for matters of law, and respected scientists or doctors for matters of science, medicine, and health, and shall be entirely nonpartisan, with no member affiliated with any party. 1. No government body, law, or regulation will sanction or reward racism or ethnic hatred, religious bigotry, sexism, or other hatreds based on linguicism (hatred or discrimination based on language) or national or regional origin. 2. Nor shall any government fail to provide redress for longstanding discrimination based on the previous. 3. Any person or institution taking part in or promoting discrimination or hatred based on the previous results in that person or institution's permanent inability to receive government jobs or benefits, including licenses, grants, subsidies, retirement including pensions and Social Security, tax refunds, eligibility for public assistance, student or business loans or credit. 1. All crimes must be punished. No president may pardon or give clemency to any in their own administration, or the administration of other presidents of their party, or to anyone who has given them campaign contributions. All such previous pardons are overturned. The guilty shall never be allowed to profit from their crimes. The guilty must pay back all wealth from their crimes and pay for all damage done to others. 2. All fees, fines, and taxes must be progressive, based on ability to pay. Regressive taxes, where the wealthy pay a proportionately smaller amount, are expressly forbidden and must be immediately made progressive. 1. Government assistance only goes to those in need and corporate welfare is forbidden. No person or corporation, nor any trust or legal entity used by a person or corporation, shall receive government assistance or funding unless they make less than double the median national income and possess less than double the median national wealth. 2. All government loans or tax deferrals or holidays or other benefits to corporations or business must be repaid, with interest at market rates. All facilities built even partly to benefit or profit private businesses or individuals must be paid for by those businesses or individuals equal to the benefits or profits received. 1. Large concentrations of idle wealth are inherently dangerous and inhumane. All income from any and all sources greater than 100 times the median national income and all wealth of an individual greater than 100 times the median national wealth shall be seized, unless it is reinvested or donated to charity. 2.All attempts to conceal wealth to avoid taxes shall result in prosecution as grand larceny, full seizure of not just concealed wealth but all their wealth, and long prison sentences which may not be suspended. Separate white collar prisons, or other prisons that are less arduous or harsh, are forbidden, and all white collar criminals must be punished and imprisoned with all other prisoners. 1. The right to privacy, unless it can be shown to directly and obviously harm others or affect national security, shall not be abridged in any way. Private individuals shall not have their private lives divulged in any form without their consent unless they commit felonies, or failure to divulge such information can be shown to affect or harm others in a direct and obvious way. 2. Libel, slander, or defamation of public figures is subject to the same punishments and standards as for private individuals. 3. Private information on public figures cannot be divulged without their consent unless it can be shown to serve the public interest. Balanced Budget-This would be disastrous in times of depression, recession, or war. Equal Rights Amendment- This is already covered by Article 11. “Right to Life”/Anti-Abortion Amendment- Most of the public supports keeping abortion legal. Article 15 would guarantee that continues. Flag Burning Amendment- This contradicts the First Amendment. Prayer in Public Schools Amendment- This also contradicts the First Amendment. English as the Official Language- This is barred by Article 11, since it creates institutional discrimination based on hatred of other language speakers. Term Limits- There is no need. The average congressman serves only ten years. Altering the Second Amendment- Too controversial. The convention would spend its time on nothing else. The crime rate, including firearm deaths, has been dropping for over 30 years. These are my proposals. Larry Sabato of the Center for Politics has his own, some that I agree with and incorporated. What are yours?